In this short tutorial, we will look at how to plan and effectively execute an effective content marketing strategy. As most digital business strategists and content analysis know, content marketing is a very essential element of an organisation’s overall marketing strategy. So, it too needs to be addressed strategically. 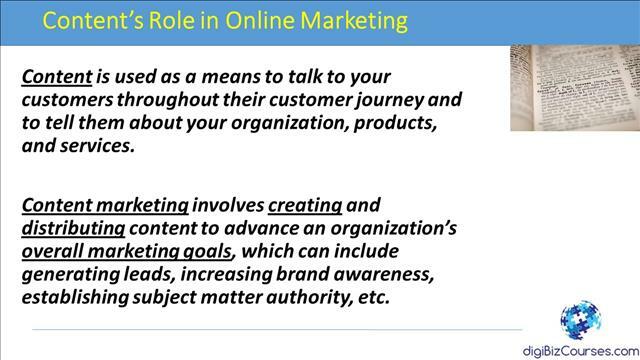 So first let’s look at content’s role in marketing. Content is used as means to talk to your customers throughout their customer journey and to tell them about your organisation, products and services. So, content refers to anything such as an email, blogposts, videos, etcetera. And it is customary for organisations to let customers know about their organisation, their valued proposition about their organisation, their vision, mission of the organisation, products and services and promotions relating to those products and services and so on. Content marketing on the other hand involves creating and distributing content to advance an organisations overall marketing goals, which can include generating leads, increasing brand awareness, establishing subject matter authority, etc. and as we’ll see that creating and distributing content must be aligned to an organisation’s overall marketing goals, that’s where strategy comes in. 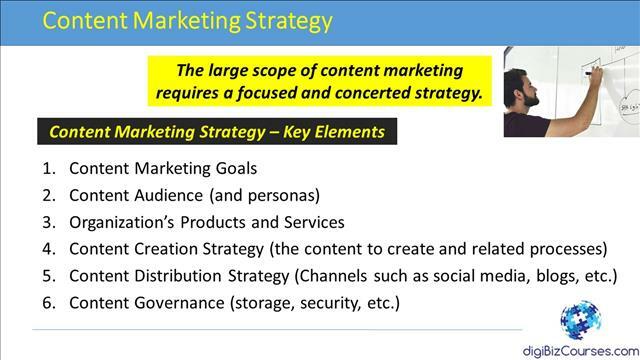 There are 5 key elements that go into a content marketing strategy. The first element is about content marketing goals. As we will look a little bit later, the content marketing goals could include things such as increasing traffic, building brand awareness, generating more leads, bringing awareness to products and services and so on. These must be identified in the content marketing strategy. Element number two of the content marketing strategy has to do with identifying the content audience and personas. So the content audience includes specific customers that your organisation is targeting. It could include the partners and vendors or it could also include your organisation’s own employees if it’s directed at them. Element number three has got to do with identifying the organisation’s products and services for which you are creating content. So, this is again is a very important element of the strategy. Item number four has to do with content creation strategy and this usually has to do with the types of content that you would be creating, which could include emails, blogs, webinars and so on and also how that content would be created. And finally, element number 5 has to do with the content distribution strategy. This has to do with the channels where you would be distributing content and those channels could include social media channels such as LinkedIn, Facebook and Twitter and so on and the content distribution strategy includes how that content would be distributed on those channels. In the next few slides, we would cover some of these elements in a bit more detail. 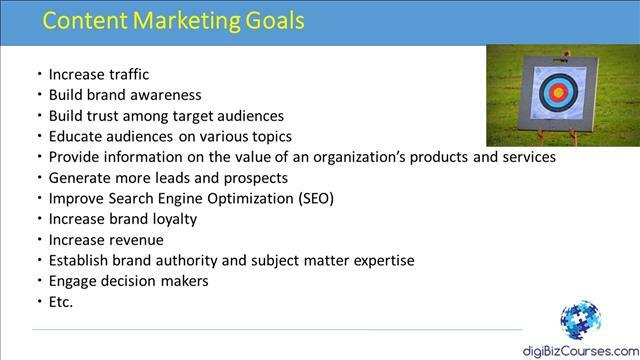 Next, we will look at some of the content marketing goals that organisations have toward their content marketing strategy. You content marketing strategy could include increasing traffic to your content, blog or app. It could be to build awareness around your brand. It could be to build trust among your target audiences such as your customers, vendors and partners and so on, educate audiences on various topics. You could do that through offering a webinar or by writing an article on a blog and so forth. You could provide information on the value of an organisation’s products and services. You could generate more leads and prospects by capturing their email information and so on. Improve search engine optimisation. So you could write content to boost your search engine rankings to have your content rank higher on search engines and have your websites and so on found on search engines. Increase brand loyalty, increase brand revenue. You could be writing content or distributing content to establish brand authority and to prove your subject matter expertise. You could also write content and distribute content to people within your organisations, such as decision makers and so on. 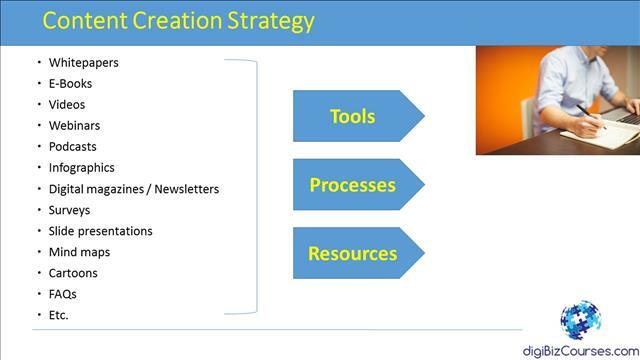 Next, we will look at the content creation strategy, which is part of the organisation’s overall content marketing strategy. As we had revealed earlier, content marketing strategy has to do with the type of content that an organisation produces and the methods on how to create it. So, let’s look at that quickly. In terms of content you could create, it could include whitepapers, E-books, videos, webinars, podcasts infographics, digital magazines and newsletters, surveys, slide presentations, mind maps, cartoons, FAQs and so on. So these are the different kinds of content that your organisation could be creating. It is important to think and plan the type of content that would be more appropriate. Once you have identified the type of content, the next part is to identify the tools that you would be using to create those content. For example, the creation of an e-book would require different kinds of tools than the creation and hosting of a webinar. You would also have to come up with an ongoing and reputable process to create these different kinds of content. And finally, you will need to identify the resources that would be involved in creating this kind of content. 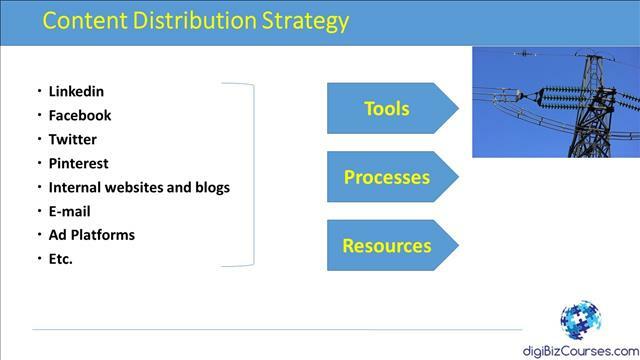 Next, we will look at the content distribution strategy, which is one of the elements of the organisation’s overall content marketing strategy. The different channels where you could be distributing content could include LinkedIn, Facebook, Twitter, Pinterest, internal websites and blogs, emails, ad-platforms so you could be buying ads to distribute content. You could be buying ads on Google AdWords or Bing ads and so on to distribute a content. Once you have identified the channels where you would be distributing your content, you’ll have to identify the tools, processes and resources that would be required to distribute that content. 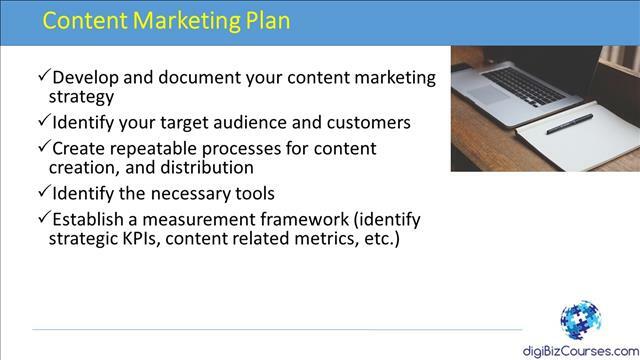 Finally we will look at the content marketing plan. A content marketing plan is essentially an execution plan. Once you have documented your content marketing strategy. A number of organisations make the mistake of not documenting your content marketing strategy. So that is one of the first steps you should do. Once you have done that, it is important to identity your target audience and customers. The next step is to ensure that you create repeatable processes for content creation and distribution and identify the necessary tools that you would need to create your content and distribute to the various audiences. Finally, one of the most important things is to establish a measurement framework. This is where you would identify your strategic KPIs and identify content related metrics to measure the effectiveness of your content and your overall content marketing strategy and plan.